Our focus is filters: we intimately know all of the filters we sell - and how to install them. Filterheads maintain relationships with several car rental agencies, used car lots, and junk yards in order to gain access to vehicles for making "how-to videos" for cabin filter replacement. We want you to know exactly what to expect at every step of the way during the installation before you even buy the filter; Our team physically goes out and performs the installation procedure and scrutinized every detail of the process. We are confident that we can guide you through the process and save you a trip to the dealership. Your total satisfaction with the products we sell is important! We work hard to make certain that our products exceed your expectations. We produce our filters in ISO (International Organization for Standardization) certified facilities. One of our requirements is that our factories operate under a control plan and flow chart. These written documents ensure that our products are manufactured, controlled and quality assured to our drawings and documented specifications. They also ensure that our products are quality controlled at various stages of manufacturing and that the process is documented properly. Once the product is completed, one final check of the critical dimensional measurements is taken, recorded, and logged into our Quality Assurance program. Our filters are tested for Fractional Efficiency, Capacity and Final Flow Restriction. These three qualities are the most important to test for to ensure the quality of a filter. Our cabin filters are tested with a special contaminant that is certified by ISO and is especially made for testing cabin filters. Using this special ISO certified cabin filter contaminant during testing is an important step to make certain that our products are of the best quality and are filtering out these types of unwanted contaminants before they enter your vehicle. In addition to the manufacturing and testing of our products, we also take the extra critical step to do "fit tests" to make certain that the products we sell fit properly in the vehicles they are made for. This is where we really separate ourselves from our competition. Filterheads takes great care and attention to detail when making our filters, coupling passion for making a filter that not only performs like it should but also fits and looks like it should. We take great pride in what we do and want you to be completely satisfied with our products and service. We want you to be a customer for life and we work hard every day towards being exceptional. *We are so confident in the quality of our product that we offer you a 100% satisfaction guarantee. 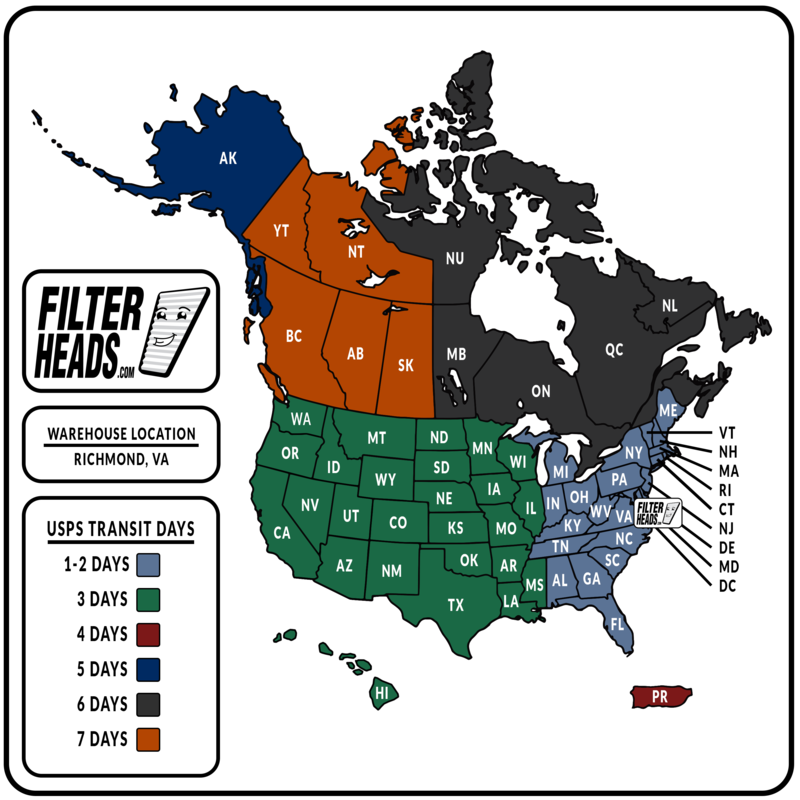 Filterheads operates our own dedicated warehouse in Virginia and ships to US and Canadian addresses only. All orders ship via UPS ground or United States Postal Service. You can check your estimated transit times on the home page under the "Free Shipping - View Coverage Map" button. We ship orders Monday through Friday and observe major US holidays. Our cutoff time for same-day shipment is 3:00 PM (Eastern) for orders. If you place your order before the cutoff time, it will be shipped that same day. Orders placed after the cutoff time will be shipped the following business day. Once your order is placed, we ship out your order (based on quantity) in the original box with a shipment label printed on top. If your order weighs more than 1 lb, we will be shipping it to you in either a bubble wrapped sleeve or a master carton box. A printout of your receipt will be included in the box for your records. We will then send you an email with the tracking number (to the email address you provided). If your preferred payment method is by credit card, the transaction will be processed after we have shipped your order. Have no fear, all of your credit card information is safe with us. We use Authorize.net to process payments; this system masks all but the last 4 digits of your card number. If you pay by PayPal, the transaction is completely settled at the time of order placement. If you prefer to place your order over the phone or talk to us for any reason, feel free to call us at: 855-598-8551.